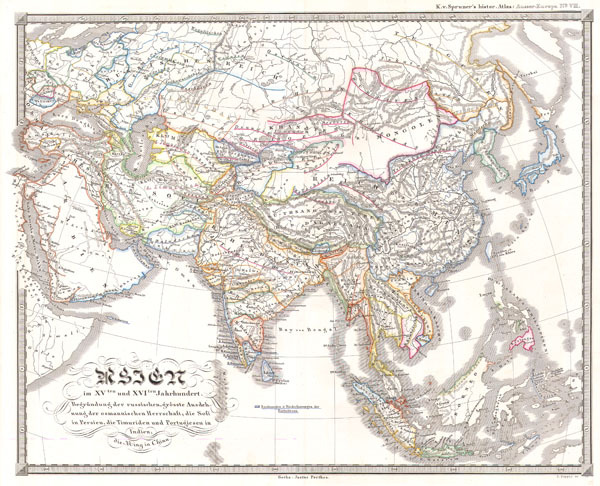 This fascinating hand colored map depicts Asia in the 10th and 16th centuries. This period roughly corresponds to the Ming Dyansty in China, the incursions of Persia and Portugal in India, and the beginning of the Russian Expansion. The Timur dynasty ruled Persia. Singapur (Singapor) is labeled. All text is in German. Issued in the 1870 edition of Stieler's Hand Atlas. Fine or perfect condition. Margins wide. Blank on verso.